Driving a beautiful car is every girl's dream and I am extremely fortunate to have such an opportunity. 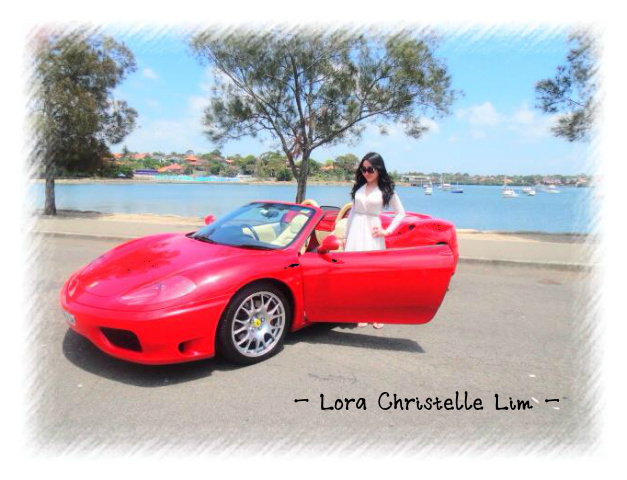 The Good News is that buying a car in Sydney is not as expensive as compared to Singapore. However, parking the car in the city or in car parks can be pretty expensive at approximately 2-3 hours at AUD65 at Westfield Pitt Street Shopping Mall (Sydney CBD) and maximum at AUD90. It's the best shopping mall in Sydney City with my favorite retailers such as Gucci, Prada, Chanel, Miu Miu, Zara, Swarovski, Ladurée, Valleygirl, Portmans, Forever New, Peter Alexander etc. The Ferrari F360 Spider is such a beautiful car that brings great happiness to both driver and passenger. It looks amazing and feels even more amazing especially when you listen to the lovely sounds of the Tubi Style Exhaust System. The car roars when you start the engine and continues to create music for car enthusiasts. It moves fast and you must be delicate in stepping on the accelerator in order to move carefully through traffic. It is semi-automatic and sometimes it can be pretty tricky in changing gear as most of the time, the car seems to have a mind of its own and always aim to shift to second gear in order to move faster on the roads. Some people have the misconception that driving a Ferrari can be extremely difficult but let me clarify that that this car is easy to drive and there is no need to go across humps in a diagonal way. We have increased the suspension so that we can drive this car conveniently to shopping malls and park in their cramp car parks. Also, the Ferrari boot is pretty big/spacious unlike the Lamborghini and I managed to put in my weekly groceries into the car every time! 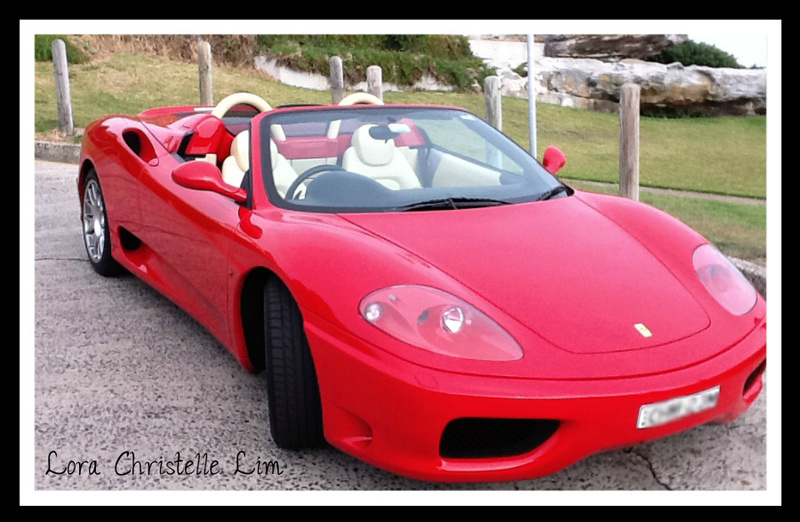 Honestly speaking, ever since we bought this Ferrari, there seems to be great excitement to wake up early in the morning in order to plan where to drive to for breakfast or brunch at a lovely beach or cafe near the beach. Waking up early to enjoy the beautiful day with the hood down was simply enjoyable. This car is elegantly designed and has an automatic hood that folds away into the engine bay smoothly just with the press of a button. It is extremely convenient to put up and down the hood without much hassle. I just love the wind blowing against my face especially on a beautiful sunny day. The funny thing to note is that driving this Ferrari can gather quite a lot of attention! Some people on the streets love pointing to the car and some even give me the "thumbs up!". I have a friend who messaged me on Facebook accusing me to be a "snob" for not waving to him but in actual fact, I did not even see him on George Street in Sydney city. There are so many people on the streets and I can't possibly be looking out for my friends in the crowd each time I drive passed right? Anyhow, it can be quite embarrassing at times when people start whipping out their iPhones or camera to take photos of the car and therefore, I usually hide my face using my sunglasses or a big straw hat or putting the hood on to avoid too much attention. 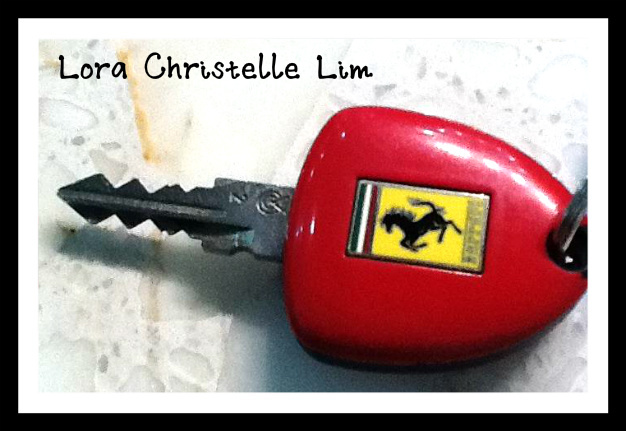 Driving a Ferrari in the city makes you feel like a celebrity which I have not hoped for. All eyes on the car! I can't stop admiring this car as well as it is truly a remarkable beauty :) Other strange things that happened to me so far is that there are some cars who wind down their windows to challenge me for a race but seriously I feel like telling them that there is no point racing due to the many traffic lights in the city and the risk of losing my license to the police. I always believe that life is precious and safety comes first!